Our thanks to the editors and staff of Good Old Boat magazine for granting permission to post this article and accompanying photos on the Web. Tord Sunden's Nordic Folkboat is a sailing legend. She was one of the few items of exceptional merit to emerge from the horror years of 1939-1945 when much of the world was experiencing the convulsions of war. Sunden's home country was Sweden, which had declared neutrality in World War II. In the early 1940s the Swedes organized an international competition for a new common Scandinavian class of sailboats. The organizers were looking for a cheap, fast, seawo rthy, one-design racing boat that could also be used for family cruising during weekends and holidays. Nearly 60 designs were entered for the competition, but none was accepted outright, and Tord Sunden, then an amateur yacht designer, was chosen by the organizing committee to pull together the most promising aspects of the top four designs submitted. The result was the nautical equivalent of the German Volkswagen, the people's car. She was named the people's boat, the Folkboat. But little did the organizers of the competition imagine how successful she would be Eighty orders poured in from all over Sweden before the final plans were completed. Today, 60 or so years after the first Nordic Folkboat was launched, there are thousands of Folkboats afloat: wooden ones and fiberglass ones. The majority are in Europe, with Sweden leading the pack, followed by Denmark, Germany, Finland, and the Unite d Kingdom. There are about 120 in San Francisco, where the San Francisco Bay Folkboat Association administers the fleet, and where the Folkboat's wonderful heavy-weather performance is much admired. Besides the Nordic Folkboats, all of which comply with the class's one design rules, there are thousands of near-Folkboats, close look-alikes such as the Contessa 26 (featured in the September 1999 issue), most of which attempt to increase her interior living space with more beam, a longer waterline, and a larger coachroof, while retaining her fabled seakeeping qualities and her classical good looks. In 1966 Tord Sunden introduced a variant of the classic Nordic Folkboat that lacked the traditional lapstrake planking. It was carvel-planked and featured a shallower, self-bailing cockpit. She also was more luxurious below. She was known as the Intern ational Folkboat, but the Scandinavians regarded that description as misleading, and referred to her only as the "IF Boat." The term International Folkboat survived in the United States, however, and the International Folkboat Association of San Francisco Bay held sway over their racing and cruising activities there. The original design concept had a long, overhanging stern, like a 30-SquareMeter's. But that was later chopped off, probably because a long overhang adds considerably to building costs. The result was a much more seaworthy transom stern. The transom, h owever, was given a handsome rake so it would better match the moderate overhang of the bow, and thus the after end of the full keel also was clipped away to line up with it. That, together with the generous cutaway up forward, greatly reduced the wetted area of the keel without affecting its efficiency. Early critics thought the raked rudder would make steering difficult under some circumstances, but experience proved them wrong. The first boats were, of course, built of wood. Their bulls were clinker-built, or of lapstrake construction, with each strake overlapping the upper edge of its neighbor below. This makes the boat strong and light. It also adds greatly to her looks by repeating and emphasizing the sweet lines of her sheer. The first fiberglass Nordic Folkboats were legalized in 1977 and were exact reproductions of the wooden boat, including the overlapping strakes. They raced on equal terms with wooden boats and were forced by the strict one-design rules to use wooden ma sts. The International Folkboats were regarded as a separate class, although their overall measurements and design were basically the same. They, too, were produced in fiberglass, but with smooth topsides and lighter aluminum masts. Between 1967 and 1984, when production ceased, Marieholms Bruk, of Sweden, launched more than 3,400 International Folkboats, hitting an annual record high of 552 boats in 1975. After that, there was a steep decline in demand, although almost 1,000 were sold in the next nine years. Frank Costello's 1972 International Folkboat, Espresso, sails in California waters near Ferndale. Frank writes, "I used to sail these boats 25 years ago on San Francisco Bay but never could afford one. Finally, my salary caught up with depreciation, and I purchased one." Production of fiberglass Nordic boats also continued apace, and a Danish boatbuilder, Folkebådcentralen A/S, of Kerteminde, has now built more than 900 Nordic Folkboats that are solid GRP replicas of the original wooden-hulled design, lapped strakes and all. The Folkboat has a rounded underbody with fairly slack bilges, a combination that makes for slight initial tenderness but more than compensates for it with comfort at sea. After that initial tilt, she stiffens up considerably, so much so that she is ab le to race in winds strong enough to keep other classes in port. The topsides and the cabintop are low, offering little resistance to the wind and making no concessions to creature comfort below. 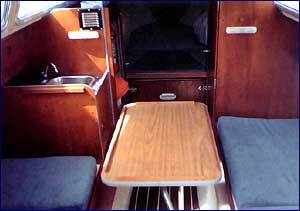 The foredeck is unclutteredthere are only a hatch and a mooring cleat to stub your toes onand convenient to work on. The cockpit is a compromise between the needs of racers and cruisersbig enough for a racing crew, barely small enough for serious deepsea cruising. 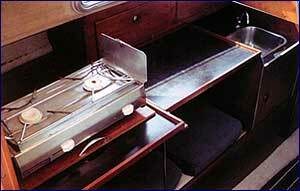 Some Folkboats have a deep cockpit that is more sheltered and more comfortable, but it drains into the bilge. Serious deepsea sailors will want the other version, a self-bailing cockpit that will not endanger the ship if it fills with water. The rudder hangs outboard of the transom, a simple, strong and easily accessible arrangement. The tiller sweeps across the after deck, but doesn't interfere much with the crew in the cockpit. The table in Espresso is interchangeable, serving as a cockpit and a dinette table. The engine is a matter of choice and depends on whether your boat is Nordic or International. Some boats have a well in the cockpit for an outboard motor of between 5 hp and 8 hp. Others mount an outboard on the transom. Still others prefer an inboard auxiliary, usually a single cylinder diesel. If you're planning an ocean crossing in a Folkboat, it would make a lot of sense to choose an outboard, and to keep it on the transom. If you find it interferes with your self-steering gear, you may have to hou se it in a well, in which case you can either leave it down, causing a little drag in the water, or remove it and store it below while you're on passage. The inboard engine makes more sense for weekenders or coastal cruisers who won't miss the valuable st owage space as much as the bluewater cruisers will. It doesn't take long to describe the Folkboat's accommodations, although they, too, can vary according to whether she's Nordic or IF, and from builder to builder. On the IF boats, there's usually teak everywhere, and vinyl headliners. The hull is lined with padded vinyl, too, in place of the wooden ceiling. 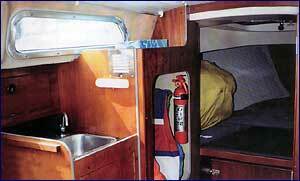 The V-berth has two berths more than 6 feet long, and the main cabin has two settee berths which are even longer. 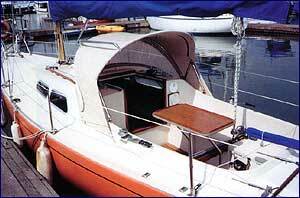 Some boats have an enclosed head compartment, and others are supplied with a portabl e head. There's a rudimentary galley, and there may even be a small chart table. There's usually a hanging locker somewhere, and a few lockers and shelves scattered around the place, though not nearly enough for a long voyage. Nowhere is there sufficient room to swing a cat, and nowhere is the headroom more than 4 feet 8 inches. The interior is bright and airy, though, especially with the companionway sliding hatch open, and seems very welcoming and protected in contrast to the exposed conditions of the cockpit. The Nordic Folkboat is a Bermudian sloop with a wooden mast and a conspicuous fractional rig the forestay joins the mast about two-thirds of the way up from the deck. This makes for a small working jib and a large mainsail. It is, perhaps, not as effic ient as a rig with a larger jib, seeing that the jib does most of the work when going to windward, but it certainly makes for happier cockpit crews when the load on the jib sheets is small. Folkboats not subject to the one-design racing rules usually have modern masthead rigs and aluminum spars. Many of the boats in the United States are rigged that way. If you're more, interested in crossing oceans than in racing around the buoys, the al uminum masthead rig might be preferable because it makes provision for double lower shrouds in place of the single after lower shroud that is standard on wooden masts. The mast is stepped on deck but appears to be well supported by a massive deck beam and seems not to compress the cabintop as so many others do. Presumably, after more than 50 years of racing and ocean cruising, the builders of Folkboats have got it ri ght. Right from the beginning, Nordic Folkboat owners agreed to race without spinnakers, to make thing easier for family sailors and shorthanded crews. But those gung-ho Finns couldn't stand it. Even though they couldn't compete internationally with spinnak ers, they raced with them among themselves. "We simply think that sailing with a spinnaker is more fun, and that it makes sailing more colorful," explained a member of the Finnish Folkboat Association. Any class that is still going strong after more than 50 years obviously has something good going for it. The Folkboat has several excellent features, not the least of which is her performance. For a full-keel boat, she is surprisingly fast and close-wi nded. 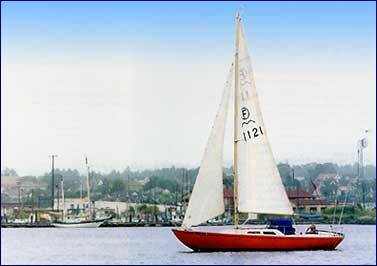 Her PHRF rating is 228 for boats with outboard engines and 234 for boats with inboards. On top of that, she's easy to handle. A picture of IF Boat 377 (Magnificent Obsession) published in Latitude 38 magazine in June, 1998, shows her rail down just outside San Francisco's G olden Gate in 25 knots and more. She has one reef in the mainsail and full working jiband her tiller is being held dead fore-and-aft. No weather helm there. The Folkboat is indeed revered for her ability to carry sail in strong winds, and no doubt her extra-heavy keel is largely responsible for this. The ballast ratio is an extraordinary 54 percent, which means the iron keel alone weighs more than all the rest of the boat. Little wonder that Folkboats were, and still are, so popular in the blustery San Francisco Bay area. "The only complaint I ever heard was that they just didn't hold enough beer for a long voyage. I know that might sound a little funny, but once you have sailed on one, it becomes the measure of all other boats you may sail. I bet you won't find many that handle as well." Her performance as a seaboat is legendary, of course. It wasn't just a coincidence that two of the six boats in the first Singlehanded Transatlantic Race, in 1960, were Folkboats. Valentine Howells raced in the conventional Folkboat Eira, while Colonel H. G. ("Blondie") Hasler sailed a much-modified Folkboat, the famous Jester, which had a standard hull but a flush deck with a central control point and a Chinese lug rig. The long keel gives the Folkboat good directional stability, and this, together with her zesty performance and her easy motion, makes her a sensible choice for a singlehanded voyager or a young coupleand we say a young couple only because young p eople are more likely to be forgiving about the Folkboat's biggest disadvantage, her lack of interior space. After nearly 60 years of production and real-life testing, there are no weaknesses left in the Folkboat that are not patently obvious, such as the cramped accommodation quarters. This is a very open, honest boat. If you're contemplating buying one for a long voyage, you'll have to look for the wear and tear applicable to boats in general. Inspect the hull for the dreaded boat pox, if she's GRP, and be careful to locate any areas of rot if she's wooden. Dance on those fiberglass decks and tap away with your screwdriver handle. As always, even if you think you know it all, it's a wise move to get a second opinion. Let a qualified surveyor check her out. It's your life that's at stake. This is another boat people fall in love with so passionately that it's difficult to get an owner to say a word against a Folkboat. Her classic beauty alone is enough to still all criticism. Yet the physical exploits of her devotees give us valuable insights into her abilities when the sole arbiter is the sea itself. Blondie Hasler's wooden Jester is both a good and a bad example of this. Good, because she crossed the Atlantic 14 times. Ba d, because she was eventually lost at sea without trace. But she was very old and she had suffered more punishment than a dozen normal boats. From the waterline down, Jester was a normal Folkboat, but the rest of her had been greatly modified by her owner, who was much given to invention and experimentation. She was a very early model, and in fact sailed from 1952 to 1959 with Hasler's "lapw ing" rig before he threw that out and installed a junk rig for the 1960 Observer Singlehanded Transatlantic Race. In 1975, a 55-year-old Australian grandmother named Ann Gash sailed around the world singlehanded in a Folkboat called Ilimo. Hasler came in second in that race, a remarkable achievement. He was only eight days behind Francis Chichester's Gipsy Moth III a much bigger and faster 39-foot sloop that crossed the finish line 40 days after the start. Jester was driven hard, and was reduced in one gale to what Hasler described as "four reefs down." The other Folkboat in that race, Eira, came in fourth out of six in 63 days. Eira was knocked on her beam ends, and Valentine Howells put into Bermuda to replace a chronometer he had lost and to repair some damage. In 1963, Adrian Hayter circumnavigated the world alone, sailing halfwayfrom England to New Zealandin Sheila II, a 32-footer. But he completed the New Zealand-to-England leg in a Folkboat called Valkyr. Mike Bale also sailed from England to New Zealand in a Folkboat called Jellicle, and had a crew for part of the way. In 1975, a 55-year-old Australian grandmother named Ann Gash sailed around the world singlehanded in a Folkboat called Ilimo. She chose the east-to-west route via the Panama Ca nal, but had the boat shipped for part of the way, from Ghana to England. 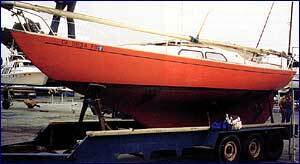 More recently, a British Folkboat called Storm Petrel was completing an unusual circumnavigation in 1998 with solo sailor Tony Curphey aboard. It was unusual because Tony's wife, Suzanne, was also making a singlehanded circumnavigation aboard her own b oat, a 30-foot Seadog ketch called Glory. They had originally set out separately, not knowing each other, but they met in New Zealand and got married in the Solomon Islands. Tony's Folkboat often beat Suzanne's Seadog into port on subsequent legs of their tandem voyage and regularly clocked up 130 miles a day in the trade winds. Their plan, once they had completed their solo circumnavigations, was to sell their boats, buy a bigger one, and carry on cruisingbut together this time. There are undoubtedly many other Folkboats that have sailed around the world and around Cape Horn, singlehanded and crewed, whose names have not been recorded in the annals of small boat sailing. There was a time, 50 years ago, when such voyages were r are, and records were kept of individual exploits. Now that they are more commonplace, nobody seems to be keeping the tally, which is a great pity. Perhaps the Internet will one day find a place for the Roll of Honor of small boat circumnavigations; if it does, the Folkboat will surely feature prominently. According to Marek Janiec, a member of the Swedish International Folkboat (IF) Association's technical committee, there are about 2,000 IFs in Sweden, and the market price there for a boat in excellent con dition is about 60,000 Swedish kroner, or $7,400 U.S. There are about 4,000 IF Boats scattered throughout the globe, which makes it the biggest deep-keel racing class in the world. "In Denmark, the price is 20 percent to 30 percent higher, and down in Europe, still 20 percent more." Sowould you score a financial coup by going to Sweden, buying a cheap Folkboat, and sailing her home? Probably not, although it's a very attractive plan, in any case. Secondhand International Folkboats sell on the West Coast of the United States for between $10,000 and $14,000, so the savings are not substantial in actual dollar terms if you factor in travel and accommodation charges. A brand-new fiberglass Nordic Folkboat costs about $40,000 in Denmark. Wherever you buy one, a Folkboat represents good value for a boat capable of carrying one or two people around the world, albeit in cramped surroundings. Besides that, if you have any finer feelings at all, you'll have to agree that she's one of the mo st beautiful boats ever made to go to sea. Just looking at her riding to anchor in her own reflection in a tropical lagoon will make your heart leap with delight. Note: These dimensions were supplied by Folkebådcentralen A/S, in Kerteminde, Denmark builders of the fiberg lass Nordic Folkboat. Speed rating: Fast for tier size an(] displacement. Ocean comfort level: One or two adults in fairly cramped conditions. John Vigor is a freelance journalist based in Oak Harbor, Wash. He has raced, cruised, and written about boats for more than 30 years. He's the author of two new books, The Seaworthy Offshore Sailboat: A Guide to Essential Features, Gear and Handling (International Marine), and Twenty Small Sailboats to Take You Anywhere (Paradise Cay), which is the source of this and other reviews in this series. He also wrote Danger, Dolphins and Ginger Beer (Simon and Schuster), a sailing adventure novel for 8- to 12-year-olds; The Practical Mariner's Book of Knowledge (International Marine), and The Sailors' Assistant (International Marine). Want to post comments about the above article on my site? Send me an e-mail message. Interested in subscribing to Good Old Boat Magazine?